Emergent behaviour describe the way complex behaviours emerge from simple rules. Conway's Game of Life is a good example. Just a handful of simple rules about how to behave in the presence of neighbours result in really complicated behaviours. 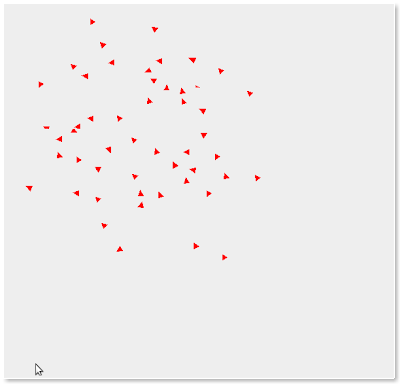 Visualizing Conway's Game of Life has some great examples. Collision Avoidance - members of the flock don't like flying/swimming into each other! Modeling this in Clojure gives me a chance to get a bit more familiar with agents. Agents provide a way to get independent asynchronous access to state. An agent is bound to some state (e.g. a Clojure data structure). Data is manipulated by sending messages (functions) to the agent. To get some flocking behaviour, we'll model each member of the flock (a boid, after the paper) as an agent. Each agent has some state (a position and a velocity). Messages will be sent to the agents corresponding to the rules above. A single agent will be used to manage the animation thread. The code for the behaviours is shown below (it's missing a few helper methods here and there, but see Clojure Projects for the full version). The behaviours are as simple as they can be. Big thanks to kfish for a nice lucid explanation of how to implement this! The animation loop is an agent with no state whose only job is to make the other boids behave, by sending them the appropriate message. This is all rendered within a subclass of JPanel which has a custom paint method. It makes a good example of the power of agents and STM. There's no threading problems whatsoever, all I need to do is take a consistent view of the boids each time I go to draw them (and STM provides that for free).